I think I've died and gone to gold polish heaven. I don't have much to say about this polish except - AMAZEBALLZ!! 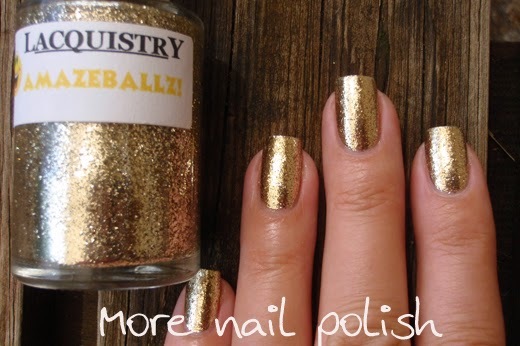 This is Lacquistry Polish Amazeballz, which is quite simply the most amazing gold polish I have ever laid my eyes on and is unlike anything I have ever seen in all my polish stash. I've never been a store stalker waiting for shop opening times for restocks, but this was one exception. Sadly I missed the first restock because of work, so I patiently waited for the next restock, as Jenna promised the was plenty for everyone! On the second restock, I just happened to time it perfectly. I checked the Lacquistry Etsy store one Saturday morning when I woke up and amazingly the listings were there. I promptly filled my cart and checked out, all even before the restock announcement was made on the Lacquistry Facebook site. I was one very happy nail polish addict . The finish on Amazeballz is not glitter, it's ultra thin super reflective gold flecks of metal. The finish is totally smooth without top coat and the tone of gold is just the sort that I love, a cooler toned platinum gold. The closest polish I can think of to this is OPI Golden Eye, but this is a much cooler toned gold and way, way more sparkly and reflective. I bought myself a double sized 30ml bottle, and I can already see a gap at the top of the bottle because of the amount I've used. I think I've worn it in four manis over the last two weeks already. This mani shows three thin coats of Amazeballz with one coat of Seche Vite top coat. Application is smooth and easy and the ratio of metal particles is such that you can layer one coat over anything for an awesome effect, or build it for opacity on it's own. Even if you have a few gaps between the shards, you can't see them because the polish is so reflective. There are still a few bottles of Amazeballz available on the Lacquistry Etsy store, as well as some double sized bottles like this. You should also see the crazy ball bottles with 5 times the normal amount of polish in them - I wish I had the money to buy one of them!! If Amazeballz sells out, I'm sure Jenna will restock again. Everyone needs this polish. OMG! 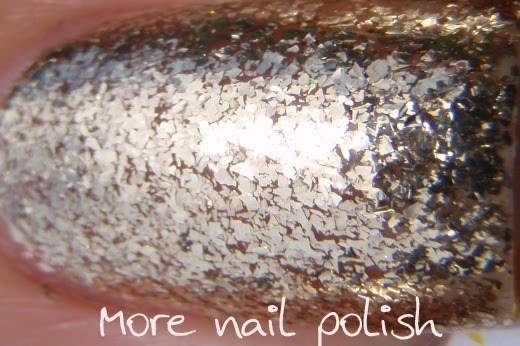 I am a gold lover like you and I need this polish! On my Christmas list for sure. That macro shot is fascinating. My jaw has literally dropped. This is absolutely, ridiculously amazeballs! I bought this a couple of weeks ago but I haven't worn it yet. I'm saving it for New Year's. I'm glad she makes enough stock so everyone can get one. Gosh, that looks awesome on you! This polish has the perfect name because it really is amazing! It's unlike anything I've seen before. It's gorgeous. Omg I posted my review of Amazeballz on my blog today too! Funny :D I love your swatches, so beautiful. Omg I've been wanting this since I saw it swatched on polishallthenails blog! But it was always OOS. Now she finally has it in stock again but only the big 1oz size is left! Debating whether I should get it or not! Wow oh wow Cathy - amazeballz is right!! I'm heading over to her Etsy store now!! I've been wanting this nail polish for so long and can never find in in stock, hope I get it some time! That is an aptly named polish! This is stunning!!! Every swatch I've seen of this is AMAZEBALLZ!! !